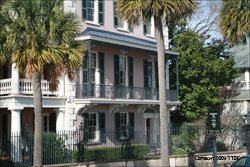 With our Charleston Transportation information you’ll be able to navigate the Lowcountry with ease. Finding your way into the heart of the city becomes a piece of cake. If you are not driving directly to Charleston, you can access the city by air, bus or train. Once you arrive, transportation options include taxi and limo services, the local bus transport system and rickshaws in the Downtown area. 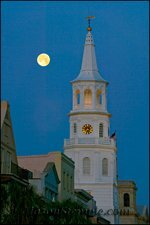 Some hotels also offer a means of Charleston transportation through shuttle services. You’ll need to verify this when making reservations. Typically, hotels near the airport will offer airport shuttles, and hotels on the immediate outskirts of Historic Charleston will offer shuttles to the Downtown area. The Charleston Airport is located in North Charleston at the end of International Boulevard, roughly 20 minutes from the heart of Downtown. Just down the street are the North Charleston Coliseum, Convention Center, Performing Arts Center and the Tanger Outlet Mall. Located on Johns Island, The Charleston Executive Airport mainly services small, single engine aircraft for the public and does not service commercial aircraft. 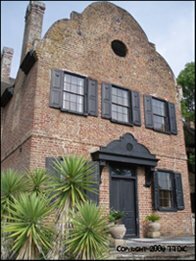 It is located about 6 miles from Downtown Charleston. This airport, managed by the Charleston Aviation Authority is located 9 miles Northeast of the city of Mt. Pleasant specifically for private and business aircraft. The N. Charleston Amtrak station is 10 ½ miles from Downtown and relatively close to the airport and Greyhound station. The Charleston Greyhound Station is 7 miles from Downtown and also relatively close to the Amtrak station and airport. Traditional Charleston transportation can be through taxis and shuttles which are are readily available at the airport. You can also request service through your hotel or restaurant. Not as reliable, but still doable, especially in season, is the ability to hail a cab from Downtown (but don’t expect to see taxis like you would in NYC on every corner). For limos, a reservation is almost always needed. The airport is not the only place to get a rental car. Car rental agencies are scattered throughout the area for easy Charleston transportation. Some will even make arrangements to pick you up, but you will need to verify that when making reservations. A fun way to get around Historic Downtown Charleston is to hail a tricycle taxi, otherwise known as a rickshaw. 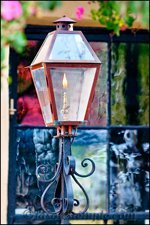 You can readily find them on Market Street in the height of season, but you can also call for reservation pick up. Honestly there is no better Charleston transportation than the rickshaw to see Downtown up close and personal. The Charleston Area Regional Transportation Authority (CARTA) supplies a route of buses to get people around town for simple Charleston transportation. They have Fixed-Route Buses servicing the greater Charleston area and Downtown Area Shuttles, otherwise known as the DASH (see map for DASH routes). Effective October 5, 2008, the Regular Fare is $1.50 for the Fixed-Route Buses and Downtown Area Shuttles (DASH). Low Income Discount Fares of $0.60 are also available for those who qualify. The Low Income Fare determination is located at the Trident One Stop Career Center located at: 1930 Hanahan Road, North Charleston, SC 29406, 843-574-1810. Children aged six (6) and under ride fixed-routes and DASH free when a paying passenger accompanies them. Seniors 55+ only pay $0.75 for the Downtown Area Shuttle and Fixed Route Service Monday through Friday from 9:00 a.m. to 3:30 p.m. and after 6:00 p.m., all day Saturday and Sunday, and Holidays (except those holidays that the Downtown Area Shuttle does not operate). 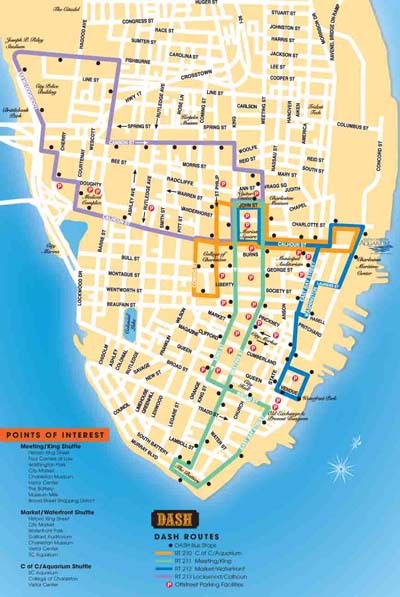 Disabled patrons can ride fixed-route for $0.40 all day, every day. Patrons with a valid Tel-A-Ride I.D. card can ride fixed-route for $0.40. You can also purchase tickets on line at www.ridecarta.com. Thank you for visiting our Charleston Transportation page.